Heat oven to 425°F. Unroll pie crusts on work surface. Cut each crust into 12 (2 1/2-inch) squares. Discard scraps. Turn mini muffin pans upside down (you will need 24 cups). Press square of dough over top of each ungreased inverted mini muffin cup. Prick top and sides of each with fork; fold and pinch corners to shape cups. Bake 8 to 10 minutes or until golden brown. Cool 5 minutes. Remove from muffin cups to cooling racks. Cool completely, about 30 minutes. In medium bowl, mix cream cheese, chopped parsley, honey and pepper sauce until smooth. Spoon about 1 tablespoon mixture into each pastry cup. Top each with 1 shrimp. Refrigerate about 30 minutes or until cold. Garnish each cup with parsley sprig and lime peel. For variety, top a few of the appetizers with fresh basil or rosemary sprigs. 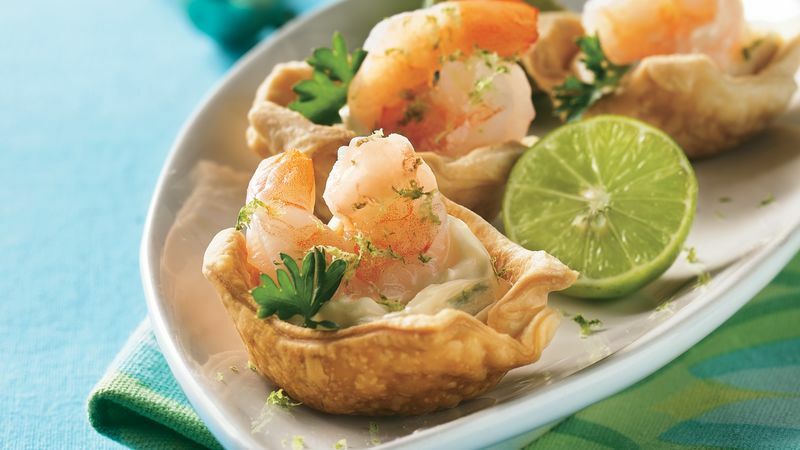 For a burst of fresh flavor, add a sprinkle of lime peel to each cup.